AFE Power 77-46307 - aFe Power SCORCHER Module BMW X5M F85; 2015-2017. A simple 5 minute install gains you a huge increase in power. The aFe Power SCORCHER Module is designed to alter the pressure sensor signals to increase boost to an optimum level throughout the entire RPM range. The result is increased performance and improved throttle response across a broad power band as well as reduced turbo lag. In recent testing these modules produced +60 horsepower and up to +85 lbs. x ft. of torque verified by our in house dyno. Direct Plug In Power: This simple and safe plug and play module adds instant power by altering pressure sensor signals to increase boost to an optimum level throughout the entire RPM range. Blue L.E.D. 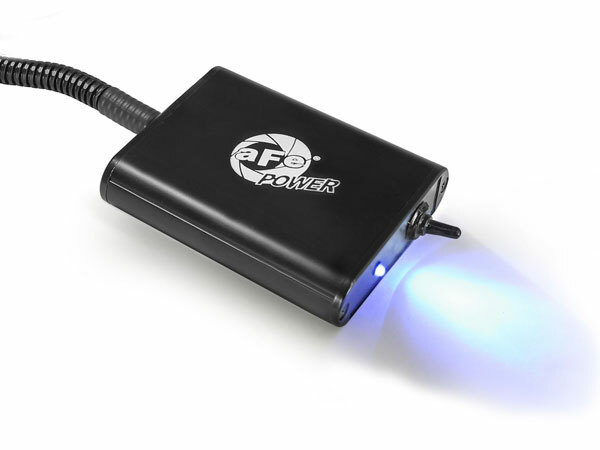 Power Light w/ 3-Way Switch: This module comes with a built-in blue L.E.D. light to show your module is powered up and functioning correctly with a 3-Way switch allowing Users to adjust between Stock, Stage 1 and Stage 2 power settings. High Precision and Reliability: SCORCHER modules are 100% tested, have output protection on all signals and are built to a 0.1% tolerance on components in critical areas. Signal filtering is used for a smooth response. These modules work great on vehicles in stock trim but are optimized to maximum performance with use of aFe Power performance parts (intakes, filters, exhaust, etc.). High Quality Materials: aFe SCORCHER modules use OE style "all weather" connectors which require no modification to your factory harness, providing a secure factory-style fit and hassle-free installation. The housing is constructed of aluminum with a hard coat black anodized finish and uses Automotive grade TXL high heat and chemical resistant wire. SCORCHER Modules come with a 2-year limited warranty. Note #1: Not legal for sale in California nor for use on California-registered vehicles. Note #2: aFe does not recommend to use with any other tuners or modules. Below are other popular parts other customers have purchased for their BMW X5M.